Toys are really important for your kids’ development. But, mix children and toys and you get a mountain of clutter, whichever way you slice it. Still, there’s no reason that the clutter has to take over your home. With a few simple tips for toy storage, it is possible to maintain a sense of order in your house (including the bigger sized toys like Hape Wooden Kitchen), and still be able to nurture the imaginations of your little darlings. In Part 1 of this look at toy storage, we highlighted a few storage ideas available on Pinterest. 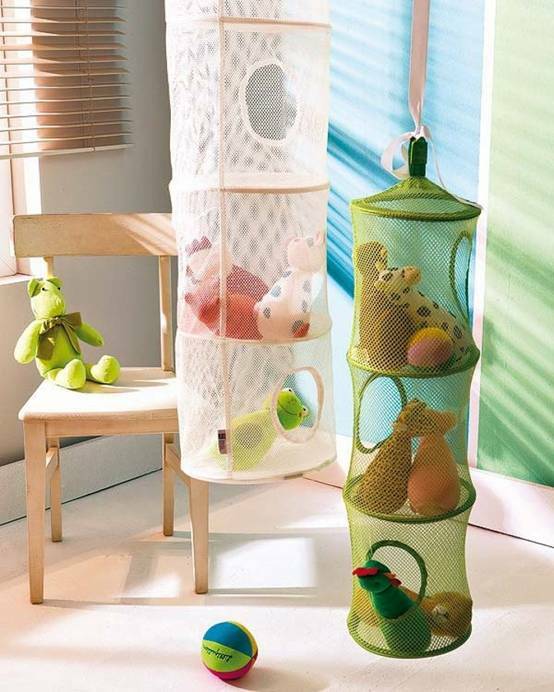 Now, let’s look at a few other toy storage ideas to keep you inspired. Just because these baskets are made for attaching plants to your outside walls doesn’t mean that you have to use them exclusively for that purpose. In fact, these baskets make for excellent toy storage. This way, you can use the space on your walls to store your kids’ toys and keep the floor clear to use as actual play-space. Again, these baskets might not have been made for this specific purpose, but they work fantastically well for toy storage. By hanging these mesh baskets from your ceiling, you keep the floor clear. And, as we all know, the floor is a major culprit for generating clutter. These might not be able to support heavier toys. 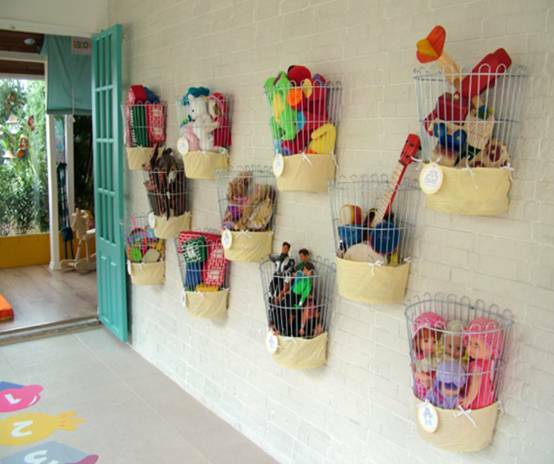 But, if your child has a lot of dolls or stuffed toys, these baskets are perfect. And, the fact that they are made of mesh means that you, or your child, can always find the right toy when you need it. Speaking of being able to find the right toy at the right time, these windowed toy bags are an excellent idea. The problem with traditional bags is that you never know what’s in them. This means that you have to pull everything out just to find what you’re after, and you end up with a giant pile of clutter… once again! But, with these, you can always find what you’re looking for. 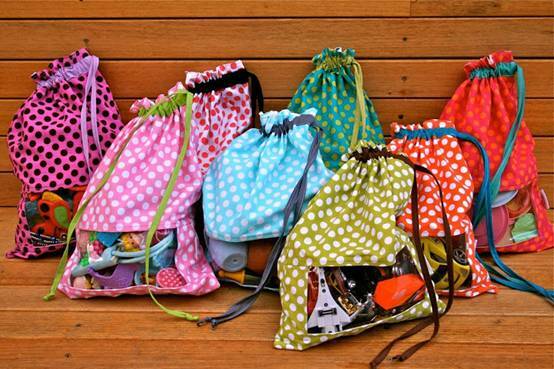 And, if you’re handy with a sewing machine, they’re really easy to make. You could use clear plastic for the window, or even mesh. We tend to only use peg-board in our garages. Why? Perhaps because it’s not very pretty to look at. But a coat of cheerful paint soon changes that. 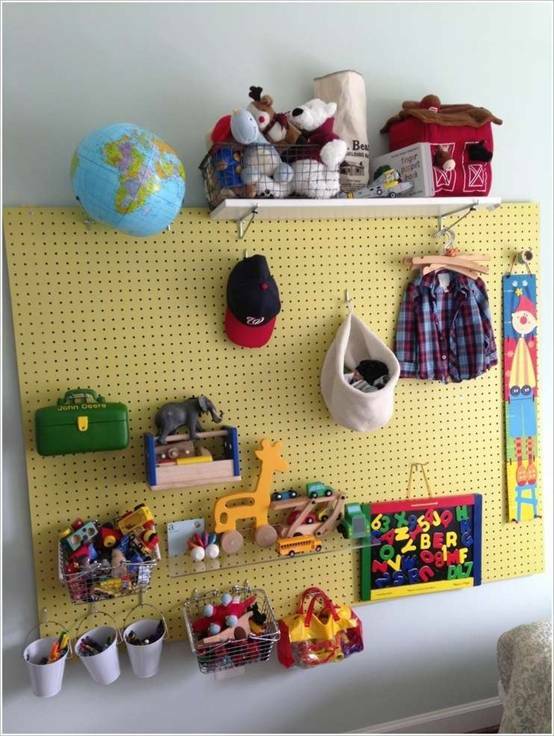 With a tiny bit of sprucing up, a peg-board can be a great storage addition to your child’s room. You’ll be surprised by the amount of things you can actually hang on it. And, like the wall baskets and hanging laundry baskets, peg-board storage makes use of vertical space and leaves the floor clutter-free. Here are some fun examples of pegboard decoration to inspire you. More Space Means More Toys! These storage ideas are simple, but they free up a surprisingly large amount of space. But, that just means that you have an excuse to spoil your little ones with more goodies from our wide range of toys! So, if you need help filling all of that extra room, or if you would just like to chat about some new ideas for toy storage, please do get in touch.